Spin Cycle: Twisting the Aces meets Hofzinser with a powerful in-the-spectator's-hands ending! Emergency! A super convincing in the hands Triumph that's easy to do! Simply Amazing: A fantastic Ace Assembly for those who don't like Ace Assemblies! Flying Colors: A transposition of red cards and black cards with a knockout second phase in which everything happens in the spectator's hands! 1st edition 2009; 20 pages. Elevation: In this effect, two ’special’ cards are pulled from the deck and placed to the side. A spectator chooses any two cards. The two cards are lost in the center of the deck. The two special cards are shown to be the two black Jacks. With just a shake, the face up Jacks trap a face down card. That card is one of their selections! You explain the Jacks do much, much more. The selection is constantly placed in between the Jacks, and magically rises to the top. Also, the selection magically flips face up and face down in between the Jacks multiple times. The selection is then placed on the table. With just a snap, it turns into the other selection. The deck is spread and the other selection is found face up in the middle. I’ve always liked the plot in which one selection changes to another, and then the first one somehow appears far away from where it once was. It’s very magical in my mund, the two card transposition. I know a lot of transpositions, but this has turned out to be a very good one. Something I like about this is that the transposition seems to be an afterthought. The other magical events are the main trick. This way, I feel, the transposition is more magical. The method here is pretty easy to do. It will require basic knowledge of card sleights. This is a fantastic routine. I love the Hofzinser Ace Problem. Love it, love it, love it. I have created my own method, which I love to use. Although I am bias to that method, this one is also very good. I like the idea of using the box. It seems like you’re making the trick sleight-of-hand proof, as you can’t touch the cards. The magic happens on it’s own. This way, you don’t seem to just be someone who is handy with a pack of paste boards, but rather a real magician who can do real magic. That’s an important idea to remember in all of my magic. So, this fits the bill. It’s super cool and super magical. Once again, it’s also pretty easy to do. I recommend you try this out, as it’s a great solution to the Hofzinser Ace Problem. Another favorite of mine, Triumph. I cannot think of a better card plot with such a great patter. I really like the additions to the patter Cameron added. It’s not the basic “a young kid shuffled my deck wrong” but it’s a comical solution. The idea of an ‘Emergency button’ reminds me a lot of the ‘Reset button’ in the standard Reset routine. I liked how he applied that to this effect. Onto the method. This is simply FREAKING AMAZINGLY AWESOME. I’ve performed a lot of Triumphs in my magic years, but this is one of the best I’ve seen. The secret move is brilliant. Although it’s stated to be “bold” no one will ever catch it. The display is very clean; they really see half face up and half face down. Simply brilliant. This will be the last Triumph routine I perform. I love this. It sound more confusing than it really is. I actually really like this as well. I think the ending is a great, visually moment. There are also some great subtleties in this effect which really sell it. I think it’s great because the spectator feels there is no possible way the magician could’ve switches the cards that they were holding, because there really isn’t. Well there is… Anyway, this is super clean. The handling is easy, but again, will require basic card handling knowledge. I assume most of you guys already know this stuff. Another winner. 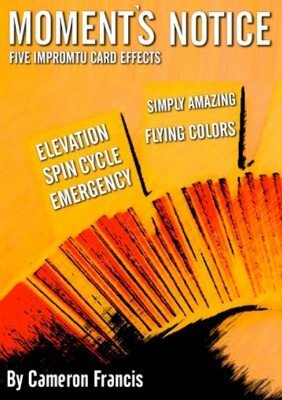 Flying Colors: In this effect, the magician removes four black cards, and four red cards. The two packets are separated. With a snap, the two packet of cards magically and invisibly change places. The spectator removes one card from each packet. With a snap, those two selected cards change places as well. This is just not for me. I’m sure it’s going to be for a lot of others, but not me. It’s is a nice trick, and I can’t really explain why it doesn’t suit me. Because of that, I will jump into the method and handling. Everything, again, is easy to do. The method is very clean and clever. Some of the magic happens in the spectator’s hands. Another nice part, the cards are not always handled by the magician, eliminating some possible solutions in the spectator’s mind. A nice trick overall. The Teaching: Everything is very well taught. There are step-by-step instructions. Also, there are 11 clear photographs that really help. Nothing to complain about. Overall: There’s not really much to say. The e-book is nicely made, all components of it. All of these effects are impromptu, hence the title, so they are very practical. All of the effects are amazing. A solid 9.5/10.